Streaming can be a bit lonesome at times. You might have already created your layouts and pictures for marketing by yourself like many do. You might also already have some questions that can’t actually be answered by looking at the hundreds of tutorials in different websites or Youtube. You want some humanly touch and possibly a streamer friend to collaborate with! 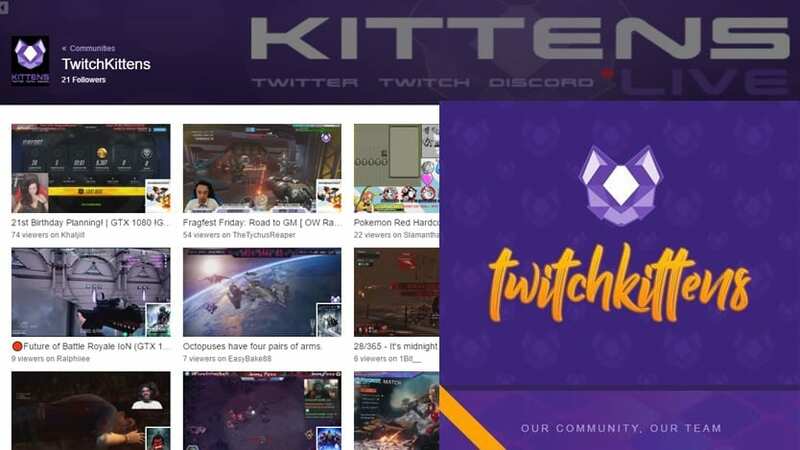 Twitch Kittens is kinda a new kid on the block but it has already stolen my heart away. You may have already seen this one of the earlier posts at How to get in touch with game devs and request game copies. The communitys core currently hangs around in Discord and everyone is really friendly. Basically you can chat around anything involving streaming over here and people like to help out a lot. There is also a spot for Twitch Links where you can let others know what you are playing currently so you can get in touch with other streamers. If you haven’t yet started to use Reddit. I highly suggest you do that! This place took my reddit virginity and the community around /r/Twitch is really good! When you need a place to ask questions for specific problems or talk about the latest things happening around Twitch this is the go-to place. When Twitch is down this is the place where pitch forks has been raised already. There is monthly events running where you can submit art, ask feedback for your channel etc. For starters i would suggest you to create an intro for TwitchDB so you can get a “Verified broadcaster” padge beside your name. This way every comment you make at Reddit is an advertisement for your own channel. There is also monthly collabration, events and such happening all the time. If you want to get know some of your fellow streamers and want to find new folks to play with. This place is really good for that! /r/Twitch also has a discord channel where you can find help for techy questions. Twitch.tv Streamers is currently the most active Twitch Streamer Facebook community that everyone should be part of. You can ask techy questions, post going live links and celebrate together when you did something awesome! This is really good place if you want to really discuss with people with real names. The mod group is really active and they have done an amazing job for clearing a lot of trolls and haters in the past months.